Read our helpful guide to second hand Audi A2. AA Cars works closely with thousands of UK used car dealers to bring you one of the largest selections of Audi A2 cars on the market. You can also browse Audi dealers to find a second hand car close to you today. All used Audi A2 on the AA Cars website come with free 12 months breakdown cover. 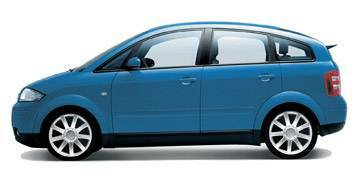 The Audi A2 was discontinued in early 2005, but that doesn't detract from the fact that it is a supremely efficient, stylish and refined car. Inside the cabin, a lowered floor and raised roof open up plenty of space and make it comfortable for all but the loftiest basketball players, while a claimed 48mpg returns make it a surprisingly economic vehicle too. As a compact MPV/supermini, it sits somewhere between the current Audi A1 and the Ford B Max, and while it might not compare to either the A1's class and sophistication, or the B Max's practicality, it is a clever and pleasing mix of functionality and fun.